Wellbeing is a holistic way to look at our health, it covers everything that can contribute to us feeling positive or negative about our lives, from job satisfaction and emotional wellbeing to physical health and economic wellbeing. These factors are often all interlinked. We all know how important wellbeing is but the reality of applying it to our lives proves more difficult. It helps to acknowledge when we are not feeling okay and take actions to prevent the build-up of negative wellbeing. Live Well is a website full of great wellbeing information and resources designed to promote better wellbeing and mental health in Kent and supports local wellbeing initiatives. Take a self-assessment test to determine your current state of wellbeing. To kick-start your personal wellbeing we have picked some practical advice below. These are the basics, you need to be doing these right to feel okay every day. If you’re not sleeping properly then you will have no energy, feel moody, and let things get to you more than normal. 7- 9 hours is usually the recommended amount to function well. Take a look at this Healthy Sleep Tips infographic on getting good sleep. Eating properly will give you the right energy and nutrients to help you deal with the day. Find out more about healthy eating on the NHS website Change for Life and remember to drink enough water to keep hydrated. Exercise is beneficial for mood as well as your physical health. Focus on the immediate feel-good benefits rather than long term goals like losing weight. Most of us need to be doing at least 150 minutes a week, how you break down the time and what you do is up to you. 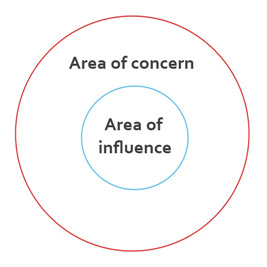 The diagram below, based on the one in Stephen Covey’s book, ‘The Seven Habits of Highly Effective People’, shows how we only have influence over the a small area of things we are concerned about. So we should use our energy to focus on the areas we can control and not things we cannot like world issues and what people think of us. Instead of getting upset about homeless people on the street, try making a donation to a charity or volunteer at a soup kitchen. We all like to complain, it helps to get things out of our system but it can get too negative, so see if you can do something about the issue or avoid these conversations. Talk to the right people, if you have an issue at work then it might help to talk to the person involved or your manager, rather than let it build up. It might be useful to have counselling, talking to a professional can help you work through key issues. A study showed that gratitude and love of learning were two of the best positive predictors of wellbeing out of 24 character strengths. Love, honesty, hope and humour followed very close. Having a strong support system will get you through most things. We go through our days and weeks not aware of what we are doing because we are mindlessly going through the motions. When it comes to the crunch, time spent with our friends and family is what counts. No matter how busy you are, making time to see your loved ones is good for yours and their wellbeing. What else can you do? Here are some ideas for your workplace. Schools’ Personnel Service run a wellbeing course to promote wellbeing in schools, email Summer Macer on Summer.Macer@cantium.solutions for more information. Sign up to our blog, our Twitter and Facebook to receive wellbeing articles and news. Find out what your school is doing for wellbeing and see if you can contribute to the wellbeing policy for staff. Talk to your wellbeing committee at school and organise activities like a staff choir, staff outings, a book club or staff sports team. Introduce team building activities which involve all staff to improve communication and relations. Kent-Teach and the Schools’ Personnel Business Support Team have started holding team building sessions. Start a shout-out wall in the staff room and encourage staff to write positive messages to thank each other for their support. Collate useful resources, initiative and information on wellbeing in one place and make sure all staff know where it can be accessed. This can be information related to childcare, staff benefits and subsidies, access to counselling and healthy eating.